Evening all, I hope those of you who attended Croydon Fun Weekend enjoyed yourselves! 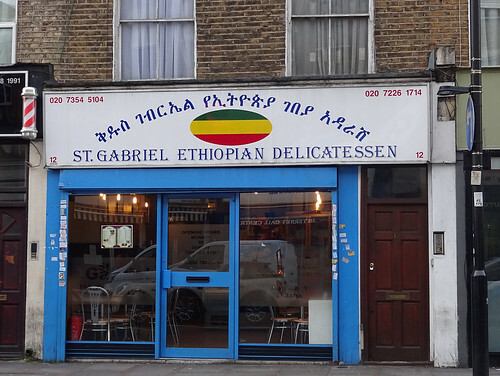 Our featured article this week is for Finsbury Park's St Gabriel Ethiopian Delicatessen, a small cafe serving some flavourful Ethiopian stews and 'nicely sour' injera. 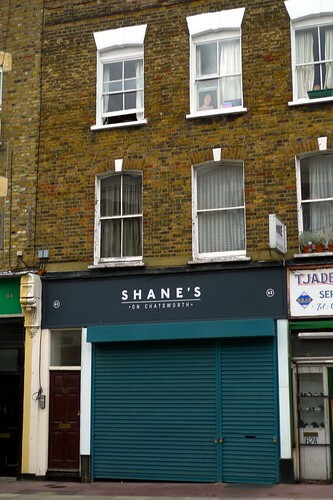 There are two new articles: Dosa N Chutny, a bright orange South Indian restaurant in Croydon which has mislaid the letter 'e', and Dans Le Noir in Clerkenwell, an experimental restaurant that has mislaid the light switches. You eat your dinner in pitch blackness! It sounds intriguing - click through for our reviewer's experience. Finally, there's an update for the Maramia Cafe in Maida Hill following a visit. Was the arayes as good as the mezze was on our 2011 visit? Indeed, could *anything* be as good as that mezze? Evening crew, here's another update to kick off your week, featuring 100% pub content. 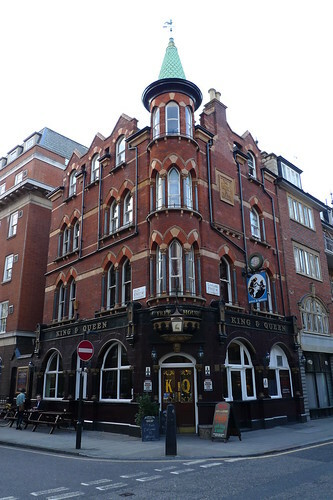 Our featured article is for a pub that's become one of my 'old reliables' over the years, the King and Queen in Fitzrovia. A haven for office workers and weekend rugby-watchers requiring no-nonsense drinking, it was mere 3 minutes away from my (now-demolished) office back in the 2000s. It has offered the same well-kept pints of Tribute, scuzzy carpet and bookable upstairs room for as long as I can remember. Sadly another 'old reliable' on the other side of Tottenham Court Road has closed - the Jeremy Bentham is now a Simmons bar (I doubt they've kept the shrunken wax head which looks more like Tim Rice than Jezza B). Other closures include the Station Tavern in Brimsdown, the Well in Clerkenwell, the Balham Arms (guess where), and the Crown near Hillingdon Hospital. Some slightly more cheering news from Muswell Hill, where the Victoria Stakes has reopened after a fire. The Camel & Artichoke in Waterloo has also reopened, while the Melbourne in Wallington is now The Star and the Norbiton & Dragon in Kingston has dropped any pretense at mythology to become merely The Norbiton. I guess I'll now have to get my dragon content from Duolingo Welsh, which seems very keen that I learn the phrase "mae ddraig goch yn ddiflas" (hashtag #notalldragons). Evening everyone - Ewan is away for a few weeks so I am back once again, like the proverbial Renegade Master. This week’s featured article is for Husk in Limehouse. It’s a cafe/community space run by the London City Mission, providing accessible space (and wifi) for working, chatting and eating quiche. We have some new pages too! Bottledog in Clerkenwell is a beer and brewing supplies shop run by Brewdog, which stocks beers by other brewers too, including some on keg; Chatkhara in Tooting is a no-frills Indian cafe/takeaway; Beer Rebellion in Sydenham is a micropub run by the Late Knights brewery, just down the road from the recently-ish refurbished Golden Lion. Your correspondent visited both of the latter two at the weekend: suffice to say one establishment was more enjoyable to spend time in than the other. 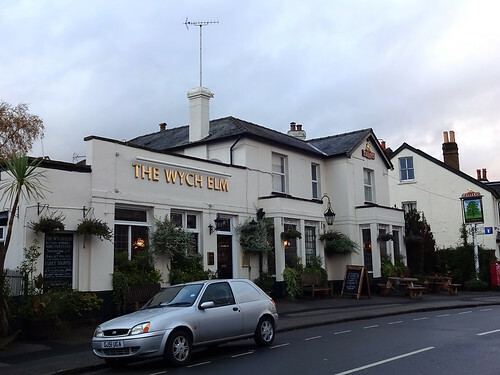 This week’s featured article is for the Wych Elm, an inviting-looking pub in Kingston, serving good food and Fuller’s range of ales. Speaking of which, I do wish Fuller’s would bring Discovery back, it’s not even listed anywhere on their website these days. Unless the point is to ‘discover’ it ourselves somehow? Let us know in the comments if you've seen it in the wild recently! There’s a couple of new articles: Rabot is a cacao/chocolate-themed restaurant overlooking Borough Market, where unsurprisingly the puddings are the highlight. Over in Clerkenwell, Foxlow does a very good steak, as one might expect from the dudes behind the Hawksmoor. Hello all, bit late this week, sorry. The featured article is Kin, W1W 6DT. This is a veggie cafe near to where I work in London's Owl Country (it's a long explanation, you can call it Fitzrovia if you prefer). 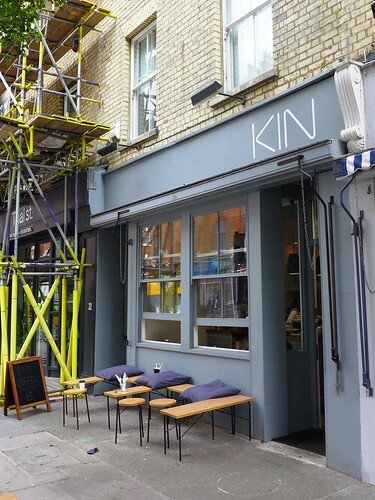 They have a sort of classic real-food wholesome vibe but poshed up a bit for yr modern market, tasty food and plenty that's vegan friendly (clearly marked) if that's your thing. Our one addition is a sandwich shop in Croydon, Stuffins Unlimited. It's a decent selection for hungry council staff, with great fresh bread. There's a brief update to The Bull and Gate to note that it's been reopened and it's more gastro than grunge nowadays. Certainly, there's no music unless you count jazz on a Sunday afternoon (NB I don't know if they do jazz on a Sunday afternoon, but it's the kind of thing I'd imagine they'd do). Two pub renamings are The Black Cat in Catford (formerly the Catford Ram), and The Flying Horse on Oxford Street (formerly The Tottenham). And then there are the pub closures. There's The Fanny on the Hill in Welling; The Smithfield Tavern by, er, Smithfield; The Noble in Crouch Hill (now The Hopsmiths, run by those Late Knights people); The Skylark and The Tin Goose both in Heathrow Terminal 1; O'Brien's in Brentford (now The Northumberland Arms); and The Lord Wargrave in Marylebone (now the Wargrave Arms, though I'm not convinced about that change of name). 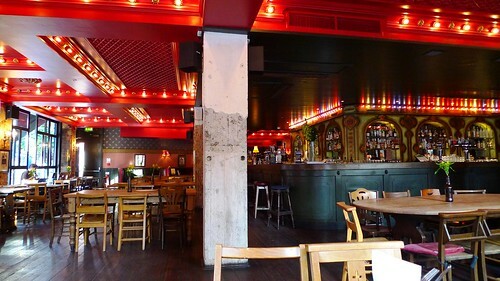 This week's featured article is for Gojo, an Ethiopian bar and restaurant near Ladbroke Grove. If you wend your way down the rather precarious staircase, you'll be rewarded with all manner of lovely-sounding things to go with your injera, including gomen wot, misir wot and shiro wot. Captain Sensible would be delighted*! Oui Madame in Stoke Newington is now Oui Monsieur! Honorifics aside, no other changes are apparent. Plus ça change, plus c'est la même chose! Finally, Portal in Clerkenwell closed earlier this year. The RGL blog will return after the May Bank Holiday - see you then. 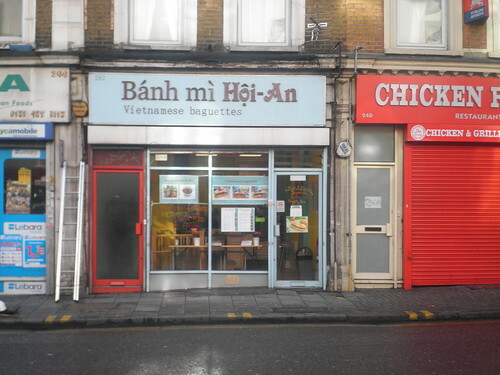 This week's featured article is for Banh Mi Hoi-An, E8 1BP, slap bang in the middle of Hackney on Graham Road. It may be small but the banh mi baguettes are fresh and the spiciness level is just right - excellent value if you're in the area. There's a new article for Martin's Place, a small bistro on Uxbridge's Windsor Street which also does good value food at lunchtime. Perhaps best to avoid the omelettes though. We also have updates to the articles for the White House Wetherspoons in Stockley Park and the Cafe Below, located in the crypt of St Mary Le Bow church on Cheapside. Apparently St Mary Le Bow used to be haunted due to all the black masses being held there in the 12th century (tsk! ), but after it burned down in the Great Fire of London (and was subsequently rebuilt by Sir Christopher Wren), the curse was lifted and the ghosts scarpered! So you can safely enjoy a nice vegetarian meal in the crypt without having spooky chains rattled at you. Finally, Thai Rapide on Clerkenwell Road has closed, and is now a kebab place called Chifafa. 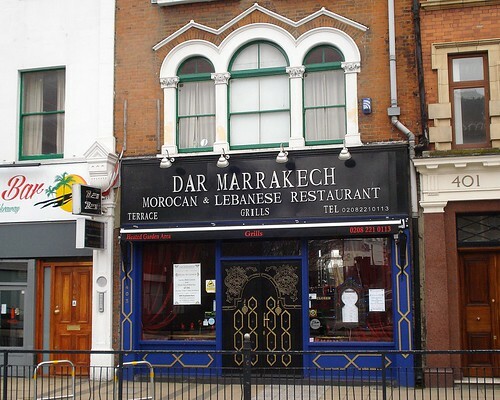 It's Dar Marrakech, E15 4QZ, a Moroccan/Lebanese restaurant in sunny Stratford. Load up on their Lebanese mezza, where they're happy for you to chop and change to your greedy heart's desires. We have two new pages. One is for Granger and Co. in Clerkenwell. It does incoherent fusion food in a nice, sort-of-gastropubby way. Most importantly, the food is tasty. We also have FARM:shop (sic) in Dalston. It's a cafe though, not a shop. Also, it's a cafe, not a farm (although it does have a garden, some chicken coops and a 'mushroom farm') so I guess we can allow that bit. 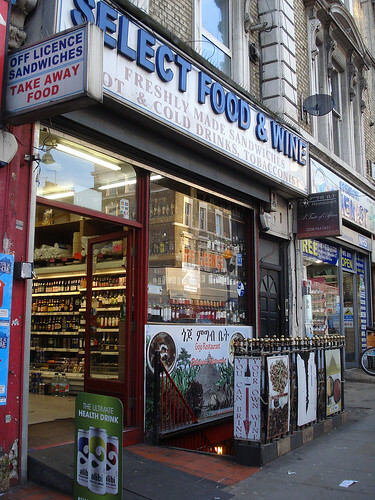 No food sampled on this visit, but will be interesting to try their local Dalston produce. There's one updated article, on Mapps Cafe, a basic caff near Hackney Wick. Decent grub, good for local workers needing to load up before a heavy day. 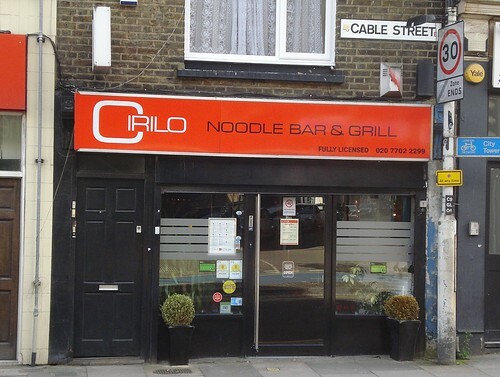 This week's featured article is for Cirilo, E1 8JG, a small Filipino restaurant in Whitechapel (on the western end of Cable Street). You might just be able to see the DLR go past through the window, as you eat your massive plate of pancit guisado. We've got new articles for Marylebone's uber-trendy Chiltern Firehouse (great food and cocktails, but massively overpriced), and for the refurbished Betsey Trotwood in Clerkenwell, which despite its new-ish coat of paint remains a cracking little pub and club/gig venue -- unless you have a phobia of Alvin Stardust. Finally we have one closure to report: the Crown and Goose in Camden. Have you been to any new pubs, cafes or restaurants this Spring? Let us know about them in the comments and we'll go and check them out. ... the Ship and Shovell, WC2N 5PH, a charming and slightly hidden little pub, one of the few remaining outposts for Hall & Woodhouse (aka Badger) beers in the capital, as yet unsullied by any word of "craft" or the like. Just a row of handpulls dispensing classic and well-kept English bitters and pales (or "boring brown ales", though I don't mean that as any disrespect: I love the BBB). The pub is rather more interesting for its unusual twin-site arrangement, taking up buildings on both sides of the little alleyway. The north has the main bar, the south has the "Crow's Nest" upstairs. Our one new article this week is for Garden Community Cafe, a community-focused greasy spoon by Prince Regent DLR out there past Canning Town. Two reported permanent closures are The Old White Bear in Hampstead (which we felt had gone downhill since it was Ye Olde White Bear and was a proper real ale pub), and The Clifton in St John's Wood, one of very few pubs in the area and a delightful little getaway, so it's particularly sad to see this one go. Finally, two more impending pub closures. There's The Star, also in St John's Wood because clearly nobody is drinking there anymore, or (more likely) property is worth more as residences. And then there's The Sekforde Arms in Clerkenwell, which your correspondent only visited for the first time a couple of years ago, and what a delightful unpretentious boozer it is, serving tip top Young's beers, and now sadly looking like it'll become a restaurant after only 185 years of sterling service to drinkers. But at least there's a couple of reopenings, both following refurbishments, and both out in Twickenham: The Prince Blucher and The Eel Pie. A quick update this week. 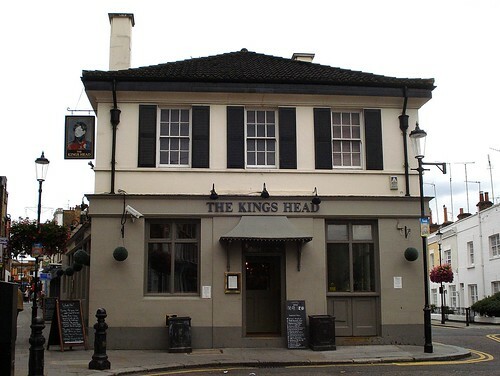 Our featured article is for the apostrophe-free Kings Head, a Good Beer Guide pub in Earl's Court. Their brunch menu looks very tempting, and there are plenty of interesting beers on offer. 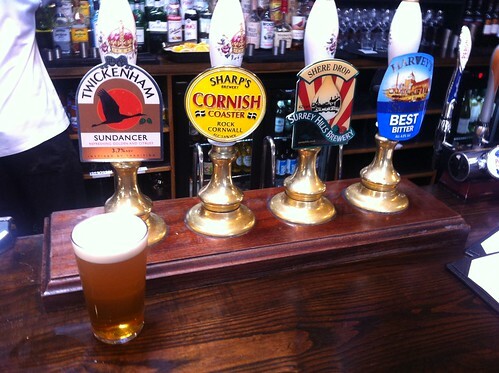 Good news regarding an earlier reported closure: the Pakenham Arms has reopened under new management. 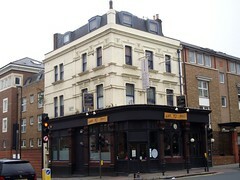 However cider fans in North London may be sad to hear that the Alma in Newington Green (which as far as I can tell doesn't have an RGL entry) is currently closed, following a dispute between the owner and Enterprise Inns. Our featured article this week is for the excellent Abeno, WC1A 1LY, a small Japanese restaurant near the British Museum, specialising in okonomi-yaki. This is a sort of omelette that the staff cook in front of you on a hot plate, and I can confirm it is delicious (though it seems they no longer have the intellectual-property-defying OLYMPIC mix on the menu). There's a brand new article for a brand new pub, in the shape of the Forest Tavern, in Forest Gate. Well, brand new might be pushing it - it's a revamp of the old Railway Tavern. It probably won't surprise you that it's part of the Antic chain, and as a result is pretty similar to its siblings in Forest Hill, Leytonstone and other places I am failing to buy a flat in. In further Antic news, Jam Circus, their pub in Brockley, is finally going to be reopening in November following a fire last year. Sadly there's also a pub closure to report. according to their website, the Pakenham Arms in Clerkenwell has been sold off, mirroring the fate of the Royal Mail sorting office opposite. We've many happy evenings there, and are sad to see it go. 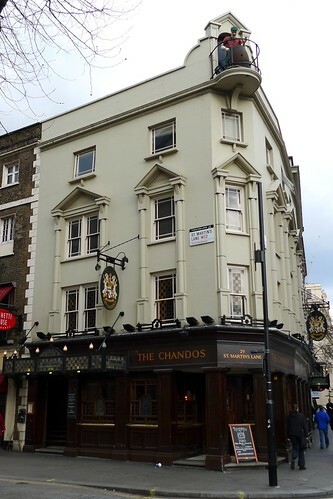 This week's featured article is The Chandos, a Sam Smith's pub at the corner of Trafalgar Square that anyone who has ever had a drink in central London will probably be familiar with. 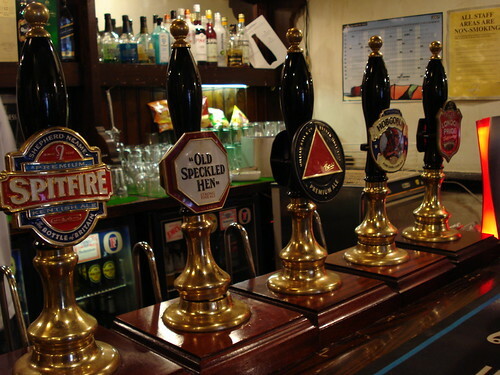 You may already have an opinion of Sam Smith's pubs, but at least their beer tends to be dependable. The new entry is The Smithfield Tavern, which you may have guessed is a tavern just off Smithfield Market, central London's major meat market. Given this fact, you'll be surprised to hear it's totally vegetarian, and the food sounds pretty good to me. Reported closures are Delfina on Bermondsey Street (probably permanent), and Mizgin Restaurant on Green Lanes, Harringay (definitely permanent; it's been replaced another Turkish restaurant). We also have a reported temporary closure for Hoxton's Wenlock Arms, but this is promised to be just for a refurbishment. Finally Just Deli in SE1 has been renamed as London's Kitchen Cafe. Hello all! 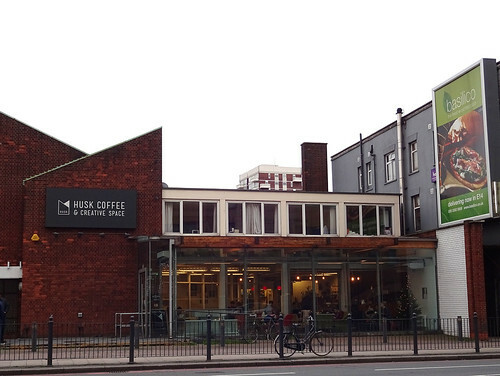 Sorry for being a day late, but this week's featured article is Wenlock and Essex, N1 8LN, which is at the foot of a dull office block but is quite a pleasant bar with a good range of drinks. Admittedly I've only visited extremely off-peak, but the burger was top notch. The new article is a branch of Pizza Express in Clerkenwell, where Goswell and Clerkenwell Roads join. Two temporary closures are The Ebury sort-of-pub-sort-of-restaurant-maybe-bar in Pimlico (closed for refurb until 2013), and The Catford Bridge Tavern in, well, Catford (closed until we hope the property's owners realise it's quite the best pub in the area, and get sick of forcing all the locals to walk halfway to Forest Hill to enjoy the Blythe Hill Tavern, or halfway to Lewisham to enjoy the Ravensbourne Arms). There's also one impending closure, which is Ship of Fools, the West Croydon Wetherspoons, which it is planned to return to being a Sainsbury's (having been one far in the past). Because we need more Sainsbury's. 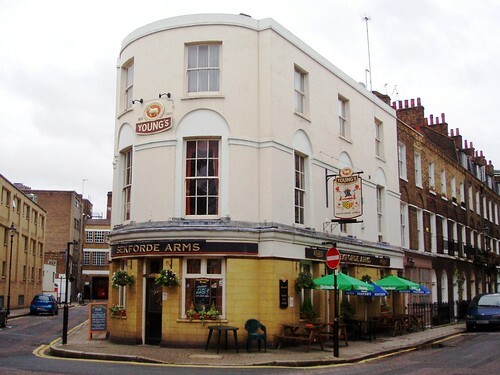 This week's featured article is the Sekforde Arms, EC1R 0HA, a cosy, old-school Young's pub in the backstreets of Clerkenwell. Last time I went there I ate a reasonably-priced lasange and blimey if it didn't hit the spot. Also one of the bar staff was wearing an enormous chocolate gold medal round her neck. APPROVED. New to RGL are the Fox Inn in Keston and the George and Dragon in Downe, both located in the London Borough of Bromley, Home of Punk Rock. Hungry? Why not try Dirty Burger, a small but perfectly hygienic pop-up restaurant in Kentish Town? Or how about Chuan Chuan Xiang, a similarly-microscopic takeaway in Chinatown that does extremely spicy skewers? There's a bumper crop of pub updates as Kake has been doing sterling work on the annual Good Beer Guide round-up: the Capitol and the Dartmouth Arms, both in Forest Hill; the George in the nice SE London Hayes; the Good Yarn and the Queen's Head in my old stomping ground of Uxbridge; and finally the Hut, the Crown and the Prince of Wales down the road in Hillingdon (a bit too far for my 18-year-old self to stomp to). 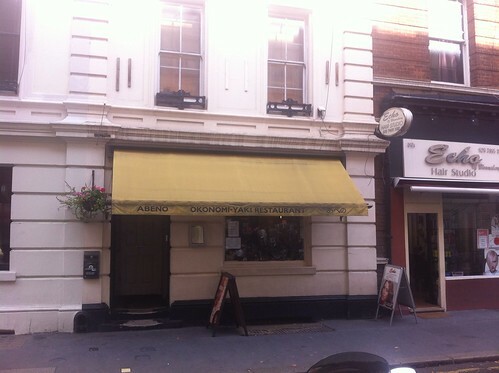 One closure to report: Soho Silks has metamorphosed from a silk shop (in Soho, funnily enough) into a dry cleaners. Apologies for another late update, but not much has been happening on RGL this past week. The new featured article is Akari, N1 8LZ, a Japanese restaurant just by Essex Road station, more or less in Canonbury/Islington. The two reported closures are The Stinging Nettle, a Young's pub in Shepherd's Bush (by Goldhawk Road station), and a rubbish one at that on my experience of it, and The Larder, a restaurant in Clerkenwell (Modern European cuisine, I suppose it would be). 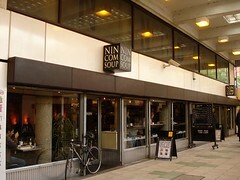 This week's seasonal featured article is a fast-food soup restaurant, Nincomsoup, EC1Y 1BE, located in the subways by Old Street station. There are no new articles, but there's an update to Akari, a Japanese restaurant on Essex Road in Islington. There are also several transport-related updates: Farringdon station (the main exit is temporarily closed, but there's a new National Rail entrance on Cowcross Street and extended platforms); Blackfriars station (there's a new entrance on the South Bank); Victoria station (escalator refurbishment is complete); and Kensington (Olympia) station (District Line services have been restricted). Some pubs have been renamed: The Rugby Inn (formerly the Grand Union) in Twickenham; The Clarendon (formerly The Nobody Inn) at Newington Green; and The Ascott (formerly The Manor) in Eastcote. Also, The Fox pub in Twickenham has now reopened.